A piebald deer has an irregular, or sometimes spotted, pattern of white and black patches, much like a pinto pony. The color of a piebald deer's skin, beneath its hair, is typically dark under the dark patches of hair and pink, like an albino, under the white patches of hair with the spotting almost always being asymmetrical. Typically, piebald deer also exhibit a coloration of the irises matching the surrounding area of skin. Piebaldisum is a genetic defect in mammals that produces the spotting condition, and not caused by parasites or diseases. The disorder is characterized by the absence of melanocytes, the cells the produce the pigment melanin. The piebald condition is very rare in the overall deer population, with typically less than two percent of population being affected. Contrary to common belief, a piebald deer isn't a cross between an albino deer and a deer with normal coloring. However, unlike albinos, which are totally devoid of coloring with pink eyes, nose and pinkish-tinted hooves, piebald deer possess the typical brown-colored eyes, nose and hooves of a normal deer. 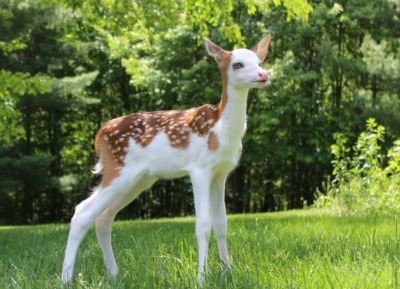 While exceedingly rare, piebald deer are more common than albinos and the extremely rare melanistic deer. Melanistic deer have the opposite disorder of piebalds and albinos, and produce too much melanin, making the deer darker, but usually not totally black. Should Piebald Deer Be Protected? Piebald deer, and albinos, are often the subjects of myth and legend in hunting circles, and killing one in Europe is said to bring death to the hunter within a year. Piebald deer are protected from hunting in a number of areas. For example, up until a few years ago permission was required from the state wildlife director to shoot a piebald deer in Oklahoma. In some states, like Iowa, it is illegal to shoot any deer that is more than 50 percent white, and full Albino deer are protected in several other states, such Tennessee and Vermont. While protecting piebald deer serves no biological purpose, there may not be a need to cull the animals. David Osborn, a wildlife researcher at the Deer Research Facility at the University of Georgia says that not all piebald deer have genetic deficits, with some suffering no birth defects from the disorder. Many sportspeople believe piebald deer should not be protected, feeling that protecting deer with the disorder can directly produce more fawns with serious health issues. However, Osborn says that allowing piebald deer to reproduce has very little bearing on overall deer-heard health. Osborn points out that deer are managed for the benefit of the overall population and what happens with a few deer won't have an impact on the big picture. Even if piebald deer are selectively removed from the population the recessive genes will continue to be spread in spite of any casual efforts to remove the alleles from the population. Osborn goes on to state that statistics reporting the frequency of piebald deer must be taken with a grain of salt. Overall, less than two percent of deer are born with the piebald defect. However, if piebald deer are kept in a protected area the frequency of piebald disorder becomes much more prominent.